A Vermont couple says that their peacock has been on the loose for six weeks, and has apparently started hanging out with a flock of wild turkeys. The case of the fugitive bird went viral earlier this week, when the Vermont Fish and Wildlife Department shared an email on its Facebook page that it had received from one of the peacock’s distraught owners. Local news station WCAX 3 tracked down the owners, Rene and Brian Johnson of Springfield, and got the full story. 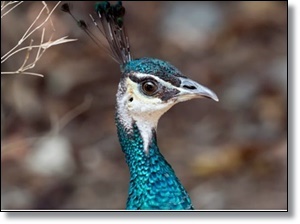 The couple believes that the peacock ― who goes by Pea, Forest or Walter ― took up with the turkeys because he was lonely after his companion, a sibling peacock, died.